Back in 1972 when Tim Van Egmond first heard the hammered dulcimer, it was love at first sight and sound. The music coming from the ringing, resonant sound of the wooden mallets hitting the strings transported Van Egmond and got him up on his feet dancing for joy. The experience moved Van Egmond to apply for the Fellows Program his senior year at Hampshire College the following year where he built and learned to play his first hammered dulcimer as a major feature of his study. Now, 30+ years later, Van Egmond has played for thousands of concerts nationwide as a solo performer, with his folk music duo Yankee Notions, and as a founding member of the contra dance band Swallowtail. Notable performances include: “A Prairie Home Companion” on NPR, the Smithsonian Institution’s National Museum of American History (Washington DC), Plimoth Plantation (Plymouth MA), Mystic Seaport (Mystic CT), Old Bethpage Village Restoration (Old Bethpage NY), and New Bedford Whaling National Historical Park (New Bedford MA). 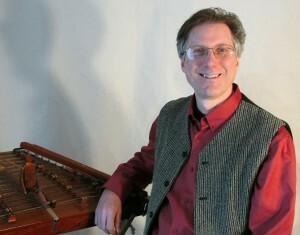 Van Egmond has incorporated the dulcimer into his solo programs as a storyteller and folksinger as well as playing for weddings, memorial services and other special events. 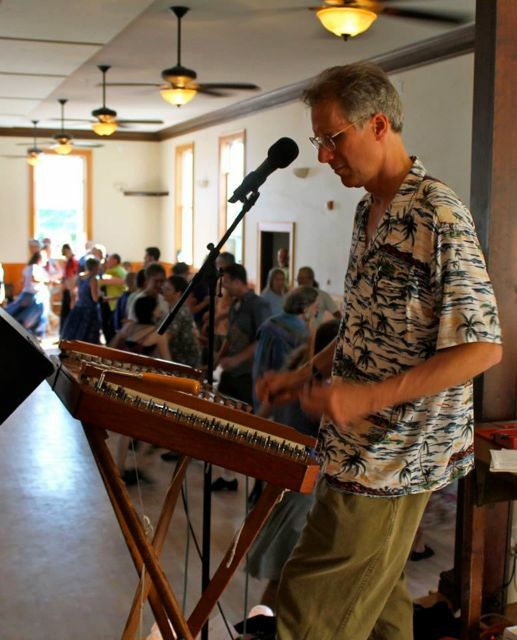 As a teacher, he has led workshops at over a half-dozen dulcimer festivals, as well as giving private lessons in his community. His folk duo, Yankee Notions, has performed for more than 20 years at hundreds of community concerts and educational programs at festivals, schools, libraries, senior centers, and heritage museums. Swallowtail’s annual East Coast Tour includes around 16 contra dance performances each year from Philadelphia PA to Chapel Hill NC where Van Egmond not only plays but is an experienced dance caller as well. A multi-instrumentalist, Van Egmond also plays Appalachian dulcimer, guitar, and limberjack — a small wooden puppet that taps out a dancing rhythm on a paddle board. He has 9 recordings to his credit with Yankee Notions, Swallowtail and other performing artists. He has received two Professional Development grants from the Massachusetts Cultural Council to attend hammered dulcimer workshops at the Upper Potomac Dulcimer Festival in West Virginia and Meadowlark Music Camp in Maine. The New England Foundation for the Arts has selected Van Egmond for its New England States Touring Program. Yankee Notions summer concert, Topsfield, MA.